STOCKTON, Calif. (August 8, 2017) – The Port of Stockton has won top honors for excellence in communications from the American Association of Port Authorities (AAPA). The AAPA recognized the Port of Stockton with the Award of Overall Excellence for the best video, an Award of Excellence for the Best Annual Report, as well as Awards of Distinction in all seven categories for which the Port submitted entries. The 2017 Communications Awards will be formally presented at the Association’s Awards Luncheon to be held October 4 in Long Beach, California. This year the Port of Stockton’s video entry, “Advantage Stockton – Port of Opportunity,” was the highest rated entry in any category and received top honors with the Award for Overall Excellence. The awards are scored by a panel of independent judges and the video entry scored well over the other entries. The Port also was recognized with an Award of Excellence for its entry in the annual report category, “Building for Tomorrow Annual Report 2015.” Both the video and the Annual Report can be viewed at www.portofstockton.com. 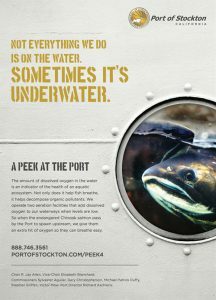 Peek at the Port Campaign won the Award of Distinction for an advertising campaign. In addition to awards for outstanding entries in video and annual reports, the Port of Stockton also received an Award of Distinction in each of the additional seven categories entered. 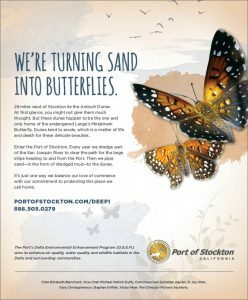 The Port received two awards in advertising for its campaigns for the Delta Environmental Enhancement Program and “A Peek at the Port.” The Port of Stockton also distinguished itself for its website, community outreach, awareness campaign, special events, and in the miscellaneous category for the Antioch Dunes Restoration Project Commemorative Medallion. Delta Environmental Enhancement Program Campaign won the Award of Distinction for an advertising campaign. The AAPA Communications Awards are presented in three different categories based on the size of the marketing budget. The Port of Stockton received honors in Category 2. There were 98 entries in this year’s competition. For more information about the 2017 AAPA Communications Awards visit www.aapa-ports.org.